Search engine optimisation is one of many digital marketing tactics a business can choose from. Email, pay per click, display and affiliate marketing are all in many companies’ marketing armouries, and whilst the cost per visitor for natural search is zero, in order to achieve organic success within the SERPs investment is required. Cheap, ‘black hat’ SEO tactics such as buying links, keyword stuffing and cloaking used to work for those looking to get visibility within the search results, but now a more considered approach to on-page optimisation, content marketing and link earning is now required to rank highly for popular search terms. Therefore, in order to get investment and buy-in for SEO it’s not surprising that business leaders require a compelling case as to why SEO should be pursued. How big is the SEO prize? 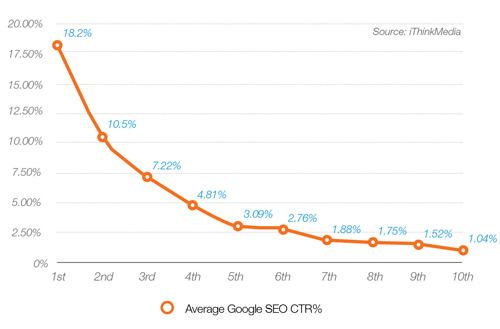 Before you can start building the case for SEO, you must first set the scene by illustrating the ‘size of the prize’. Carry out an audit of your website and use your web analytics to identify what natural search is currently contributing to the business. By understanding how much value SEO currently contributes in terms of visits, conversions, leads and sales, you can begin to understand where you currently are and where potential improvements can be made. Once you have carried out an audit and created a baseline to measure against, you can start putting together a case, with numbers, to illustrate how improvements to natural search by using SEO can positively impact the business. Therefore, for the purpose of this post, I’ve decided to consider just Google in my calculations and I’d suggest you do the same for the time being. 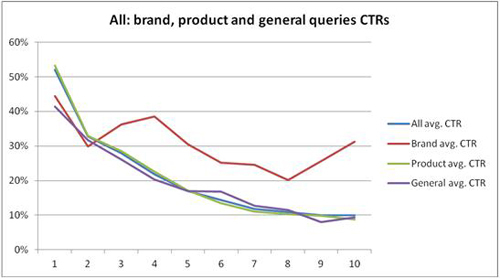 Whilst SEOMoz released research showing average CTR % for brand, product and general searches, indicating that websites ranking in position 1 had a 52% CTR. (For a closer look at sector-specific CTRs for rankings, check out this excellent post featuring some really interesting and useful infographics). The last piece in the puzzle is to calculate how each main key phrase converts. 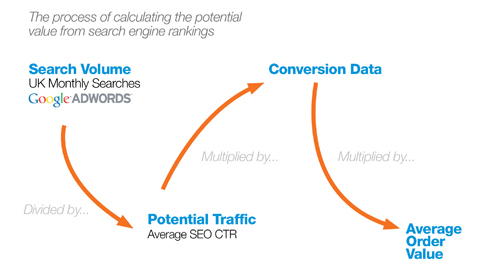 This is something that can be done when carrying out an initial audit of your website’s current SEO performance. Once you know the conversion rate this can then be multipled by your average order value to give you a rough indication of how sales could be affected by improved natural search traffic for your top key generic search phrases. A version of this post was originally published on Smart Insights on 20th March 2013. I cross-post it here with all the links and tags for your reading pleasure!